Jimmy Choo was already a faithful companion for brides-to-be, providing them with exquisite shoes model and purses, especially created for this unique occasion so much sought after by many women. Now the famous shoe maker has finally released his first collection entirely dedicated to marriage ceremonies – a line that seamlessly melds glamorous shoes, sandals and chic sequined sneakers for every taste. Rock, traditional or offbeat, Jimmy Choo has created pieces for all types of brides, from the fun loving ones to the shy and more traditional ones, but who are all in love with beautiful things, stitching details and refined materials. Vintage lace and silk satin, some pieces are embroidered with jewels and Swarovski crystals as a reminder of the finest creations that the brand has displayed on red carpets. Stilettos are dominant and there is a wide variety of models too choose from for those who want to play the star for one day. These perched delicate heels are combined with high platforms and intricate laces, but they can also be seen on classical open toe models. However, the reputed fashion designer proved to have a deep understanding of the marriage market and of the future brides’ tastes. This is why, he has also thought about beach girls providing them with flat sandals adorned with Swarovski crystals. Basketball shoes are also available for those women who want to play the role of a stylish, but non-conformist bride. The shopping experience is also taken into consideration and the exclusive London boutique of the house offers, upon appointment, bridal rooms and parties accompanied by campaign. And, of course, because white is no longer the single chromatic theme chosen by future brides when it comes to their outfits, the prestigious brand offers re-coloring services in the tone picked by their selective and quality loving clients. When coming from such a rich leather, luxury and fashion related lineage as Gucci, how to escape the fate that guides you towards what you really are? This is probably the question that haunted Alessandro and Guccio Gucci, great-grandchildren of the founder of the legendary brand, Guccio Gucci. Starting from the idea that people never change and that the first love cannot be forgotten, they decided to create their own line of fashion and prove they are as good at designing clothes and accessories as their ancestors. The global brand nowadays owned by PPR (Gucci Group), would have not forgiven the use of their name within the same industry. 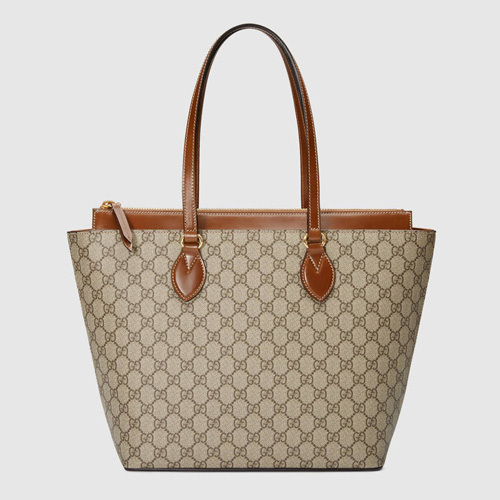 Therefore, they have chosen with no remorse “To Be G” as signature for their initial line of bags and shoes. Thus they avoided trademark infringement lawsuits and they also position themselves as a distinct brand on the market. They actually claim having their own vision and not trying to replicate the famous brand’s models. This year marks the third season of their new original fashion story. 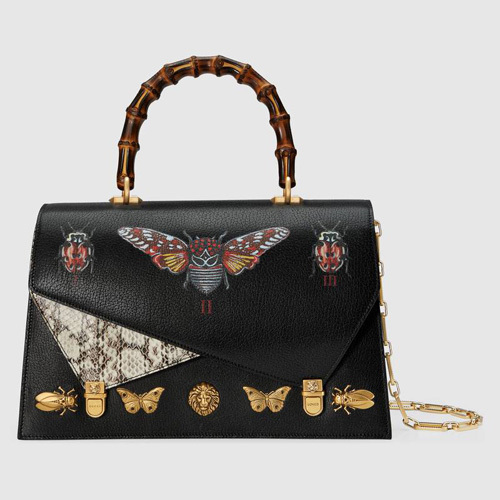 After the first lines of bags which include both modern and classical designs, they even launch a collection of ready-to-wear clothing items such as jeans and leather jackets. Whether they come in the form of “grandma bags” or as innovative trendy skirts and trousers, all their products are valuable Italian trophies manufactured in the historical plant of the founding ancestor of the dynasty, in Scandicci near Florence. They are sold in some of the finest shops in Europe and bear all sorts of inspirations and patterns. Spanish matador cuts of leather jackets, floral embroideries crocheted on bags and clothes, stiletto heals combined with casual fur garnish, all their lines of products address those quality and price aware customers with a cultivated aesthetic sense. There are a few secrets that hairstylists want to keep or they won’t tell you because they might lose some of their costumers. Here are some of the great tips you can use to make your hair look amazing with the new trends and pay less. This year the trends show us amazing colors and edgy styles. Of course, you will need a good professional to obtain those but you can make a few cuts from your budget if you dye your hair at home or at least do all the hair treatments there. Dying your hair at home is not very hard, all you need is a good friend to help you out and your tools. Make sure that you wear protection and follow all the instruction steps and it can look really good. I would recommend trying new colors at home because you don’t know how they would turn out. For complete makeovers a hairstylist should do this for you. 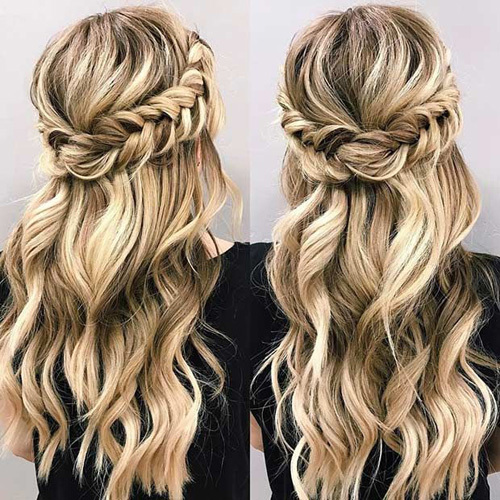 Curly, wavy and healthy hair is one of the trends this year and you will need to keep your hair shiny to achieve this look. You can use some homemade treatments to enhance the way your hair looks. For dry hair you can use egg masks, yogurt masks, and even banana and milk masks. For a shiny hair you can make a honey and vinegar mask. Don’t worry about the smell, if you rinse very well and dry your hair it will disappear. So just follow these tricks and your hair might look like that amazing hair you see in the magazine. It doesn’t matter if it doesn’t have that much volume or a certain dynamic to it; most of the models have hair extensions. The most important thing is to have a healthy hair and enjoy your haircut and color, which will definitely give you a trendy attitude. Women always want to follow the latest trend and besides clothes there are always new accessories to choose from like watches, belts, jewelry, eye-wear, etc. When it comes to watches there is a great variety of brands and styles women can choose from and designers manage to come up with styles suitable even for the craziest tastes. However, watches can be pretty expensive if you choose a high fashion brand and not all women can afford buying several watches or even only one piece. Prices can go up to thousands of dollars and for the average woman some watches are inaccessible. The good news is that there is a way you can wear an expensive looking watch without paying the actual price for it. Replica watches are a great option for those looking for the glamour of the brand but cannot afford paying the extremely high price. Watches and accessories don’t look the same on different skin undertones so make sure that when you buy a replica watch you get one matching your skin undertone. For yellow skin undertones the best watches are those in cooper, yellowish and gold colors. You can also try some that have orange, yellow or brownish stones because they will definitely complement your skin and make it shine. For women who have a blue skin undertone the best color is silver and when it comes to stones they can choose from silver, white, grey and blue to complement their skin. Blue undertone is common with women that have porcelain white skin or very dark skin while the yellow undertone is found on tanned skin or brown skin. When you buy an imitation watch you will have a big variety of colors and styles to choose from so make sure that you get one that suits your look. Besides skin undertone you will need to make sure that the replica watch suits your style. If you want an everyday watch you can get something casual but if you want something that goes with your office look you should definitely stick to the elegant looking watches. There is another style that goes well with dresses which is the jewelry watch. Ladies Datejust replica watch have different stones that shine and they look more like a bracelet than a watch. You can wear these at a cocktail dress or when you want to look glamorous. It’s not hard to find your perfect replica watch when you have so many affordable styles to choose from and you can always buy more if you want one for every look. Brooches were left in obscurity for a few years in the history of fashion, but thanks to the latest trends and people trying to improve their outfits through various accessories, brooches are a key fashion item once again. They have been known since ancient times and one of the favorite decorative jewelry for a lot of important people, especially in the Victorian era, but their history is known from way back during the Bronze Age. Women used to wear them for both decorative and practical purposes, such as fastening a piece of clothing. 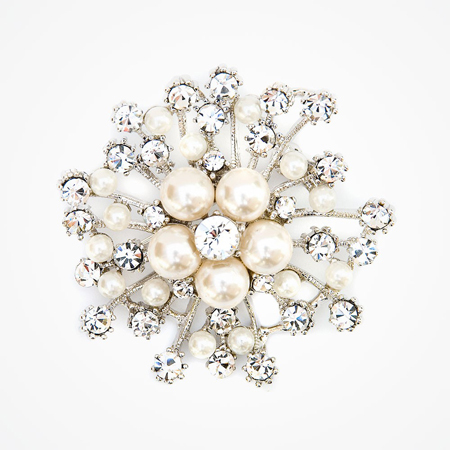 Nowadays, brooches maintained their purpose and are one of the most versatile pieces of jewelry. There are many types of brooches, but the first thing you need to consider when choosing one is the size. You need to make sure that you have the right size brooch for the type of clothing you are wearing. If you are looking to make a fashion statement, or you want to follow a trend that involves large chunky pieces of jewelry, you are free to choose a bigger brooch. However, if you want to add your brooch to a simpler outfit or an elegant one, you should just go for something more subtle and perhaps less colorful. While we are on the subjects, you should remember that the color of your brooch has to match the rest of your outfit or it can be that beautiful colorful item on a very bland type of clothing. There are also different styles to brooches, some will prefer more elegant vintage or antique styles, while other will like more futuristic models. There are also cute and playful styles, mostly suited for casual wear; never combine those styles with an office suit or something similar, it would look very wrong. When it comes to the materials your brooch is made of you can choose from a variety of things. From metal brooches that are not made from any precious material, to gold or platinum brooches with diamonds and other fancy types of designs. It is up to you, and your budget, what you will choose to wear. Brooches can be a really fun way to improve any dull outfit and make it look more original. There shouldn’t be a list with reasons why one needs to wear a golden watch, but if you plan on buying one or you are unsure what accessory would make you stand out, a gold watch is definitely the right option. A gold watch can be used as jewelry, especially for men, so it can be a versatile accessory whenever you want something precious on your wrist. 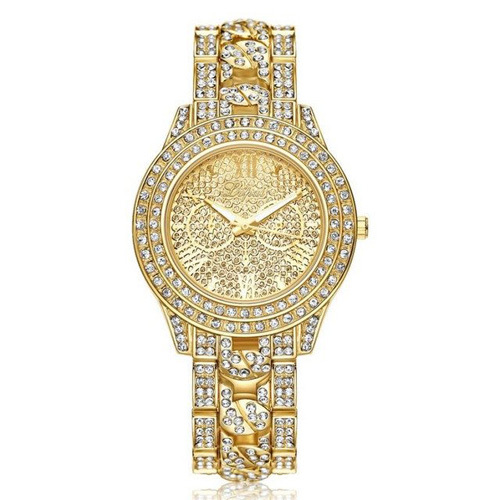 If you are a woman, a gold watch that comes with precious stones and a lovely design will definitely look better than any bracelet you can buy. A gold watch will stand out in a club or in an elegant setting so it’s the perfect accessory for a man or a woman who wants one piece of accessory to wear all the time. It can become a signature accessory that you will always wear, especially if it remembers you of a certain moment in your life. This may not mean much during cold season but you will certainly love to wear a gold watch during those summer days at the club or while wearing a beautiful elegant dress or suit. Not to mention the fact that you will have quite a classy approach to your outfit. Corporate, leisure or club outfit, it doesn’t matter, heads will be turned when you wear a gold watch, so it’s a good idea to buy this accessory as a status symbol. 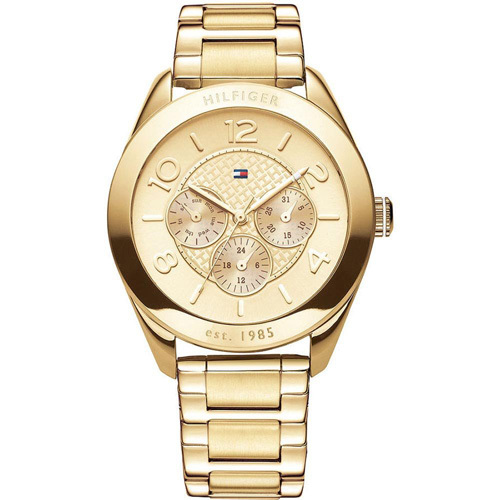 Not to mention the fact that a gold watch looks absolutely amazing on anybody. Gold is durable, that’s why people have been prizing it so much and bought it. It’s also expensive and makes you look like you want quality. 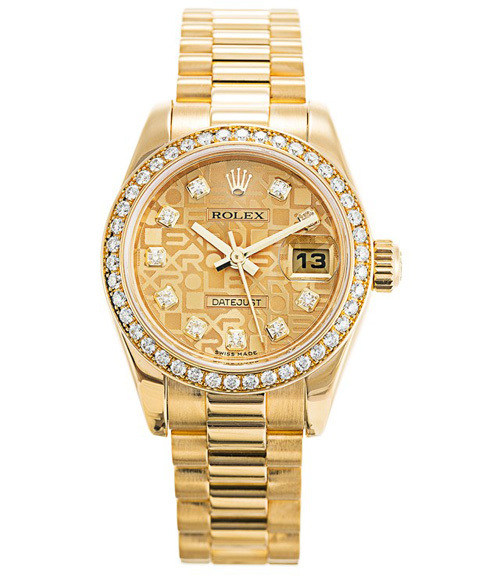 A gold watch will never oxidize or rust like common metal watches. Also, if you have a common metal allergic reaction, gold is definitely for you. Want to start a family trend? You should definitely start it with a gold watch that you can give to your son and he can give to their son and so on. A gold watch will be durable enough to go for 20 generations, not to mention the fact that it is a great investment, especially if we are talking about a famous brand gold watch. If your bicycle is a part not only of your daily exercises, but also of your everyday life, you have to be always informed about new gadgets and fashion accessories for bicycle riders. No matter if you are planning a long bicycle trip across the country or you just would like to be well equipped, there are some not only useful, but also nice items you can have as a bicycle enthusiast. Cycling clothes. No, these are not just nice elastic suits for cycling. The fashion high tech cycling clothes are illuminated! New materials with incorporated microscopic light reflectors are used for design of fashion vests, jackets and helmet covers. They make the body of the cyclists visible in the darkness on the same way the lights of the cars are making the road signs visible. During the day, when the light is enough, the cycling clothes have the look of regular stylish clothes. IllumiNITE® is one of the sport brands, which offer light reflecting cycling clothes and accesoires. Cyclocomputer. This gadget for bicycle riders is a must if you would like to track out your everyday ridings and follow up the improvement of your cycling abilities. Many people confess that the cyclocomputer keeps their motivation for regular exercising. Actually, these “smart” accessories do everything you need: they show you the speed of the bicycle, time and distance travelled, average calories burnt, heart rate and many other characteristics of your training. If equipped with a GPS system, the cyclocomputer can show you the new routes and to store the old ones. Forget about paper maps and trust your new gadget! Saddles. Though for many people saddles cannot sound very fashionable, actually the modern bicycles have stylish and high-tech “seats”. The new saddles are products of the up-to-date findings of the ergonomic design and make the riding safer and comfortable, regardless of the distance. There are special saddles for men, which support the tailbones and assure better ventilation of the groins. Women saddles have wider support on the back with decreased pressure of the cut-out on the female soft tissues. Lights. They are so special fashion accessories for bicycle riders, that they can be placed everywhere. First, stylish lights stay on the top of the helmets. These headlights are extremely powerful as they can show you everything in the direction of your eyes. But this is not enough. On the second place you may install a high tech headlight on your handlebar, like the Cateye 220 model. An optical lens technology is used in this headlight, making it flash in the darkness. This way the bicycle is visible by the others means of transport, whilst the batteries are used slowly. On the contrary side of the technology is the K2 model of Nite Hawk: it emits steady light due to revolutionary microprocessor control. You may ride more than 4 hours in the darkness with the special battery of the headlight. The fashion gadget can be installed either on the bicycle handlebar or in the helmet. Lindsay Lohan is known for being the child actor that went on the bad path of success. She has been arrested for possession of drugs for drinking and driving and has been always involved in some scandal. Besides making bad life decisions Lindsay Lohan would often come to events badly dressed and very drunk. The two aren’t mutually exclusive which can somehow justify her taste in clothes. Here she wanted to make sure that she looks a bit more like a hipster and a bit modern but really what she did in the end was to fail at fashion. She was just released from the Rehab Center and she appeared in public wearing this. Although everybody is glad for her and hopes she will have a more balanced life we cannot miss the lack of taste when putting together this costume. The first thing that strikes is the blue flowery dress that looks like a dress my grandmother would wear. On its own, the dress could actually be cute for a French-Amelie style look, but paired up with a brown leather jacket it simply looks horrible. Such combinations of clothes should be illegal because they make our eyes hurt. Sure, she could have worn the dress on her own or the leather jacket on her own paired up with the boots but all those things put together scream desperation to look different. But it doesn’t end here, she decides to throw in a bag that looks completely horrible and added to her outfit doesn’t bring anything good. Also, the fact that she decided to get under the knee socks in combination with a short dress and those terrible boots is probably a worse decision than deciding to take drugs. She probably wanted to go for the hipster look but it wasn’t a great decision, especially since all the outfit pieces matched terribly together. Also, the problem is that transparent socks give you a more elegant look but when paired with boots that simply look horrific, you won’t get a great effect, actually you will get the worst thing in the world, which is probably this look. 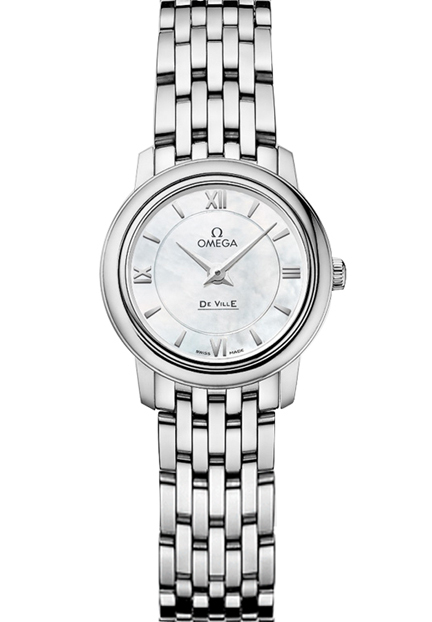 Omega De Ville Prestige watches catch your attention with their classic, stylish design. These timepieces are definitely a characteristic of pure luxury. The Omega De Ville Prestige collection is one of the most popular collections of this brand, each model being chiseled until perfection has been achieved. The true ladies will appreciate these timeless classics with a fine retro touch. If you strive to be fashionable, the Omega De Ville Prestige 24.4mm Model 424.10.24.60.05.001 is an essential, yet functional, element of your outfit. Also, if you are an amateur of quartz watches, you have to take into consideration this model. This Prestige watch is an everlasting masterpiece, especially because it is made out of stainless steel. The mother-of-pearl dial of the watch is divided into two areas. The Roman numeral hour indexes can be found at the 3, 6, 9 and 12 o’clock positions. The index hour markers and the numerals are polished with steel, so that they can be distinguished easily on the clock face. The dial is protected by a plain scratch-resistant sapphire crystal and is surrounded by a fixed bezel. As platform for the whole structure, formed of the dial and the bezel, serves a 24,4 mm diameter stainless steel round-shaped case mounted on a stainless steel bracelet. 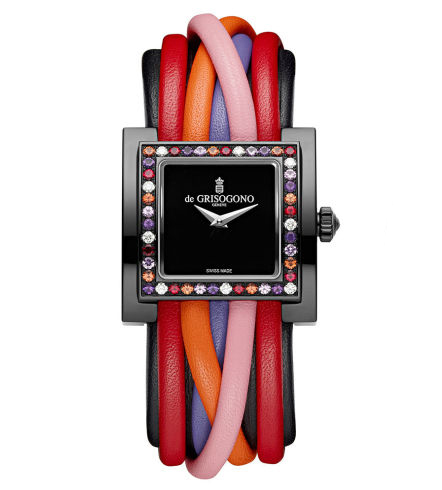 So, this watch will delight any woman who tends to wear smaller watches. The bracelet closes with a push button folding clasp. It can be freely adjusted if you feel that it is needed, fitting a wrist of up to 6.5 inches. In comparison with other models, the Omega De Ville Prestige 24.4mm Model 424.10.24.60.05.001 has a solid case back and has no screw-in crown. This Prestige watch functions due to the Omega calibre 1376, providing as precise as ever possible quartz moment with rhodium-plated finish. The battery life lasts 48 months. The wristwatch is water resistant to a relative pressure of 3 bars (30 meters/100 feet). If you intend to purchase this model, then be sure you receive the two-year international warranty from the date of sale. The warranty covers manufacturing defects and battery replacement. But, take care. It does not cover scratches, crystal or glass damage, straps such as leather, fabric or rubber, damage due to wear and tear, damage resulting from wear under conditions overcoming the water resistant rating of the manufacturer, or damage due to physical shock and/or accidental abuse. If you observed any damages on your wristwatch from the start, do not try to repair it by yourself, and do not give it for repairs to another source. All warranty repairs have to be handled by the manufacturer directly, otherwise you risk to remain with your problem unsolved. The manufacturer will replace the necessary parts or, in very rare circumstances, it will replace the watch. If you found yourself in the situation in which you have to use your warranty and return the watch to the manufacturer, do not forget to include a copy of your invoice and a detailed letter indicating the problem, the return address, contact phone numbers and email address. Also, you should know about the crown positions of the watch. They are two in total. The normal position or the wearing position is when the crown is set against the case, so that the watch encloses its water-resistance feature. The second position is for time setting. Here we can mention that the watch has just hours and minutes hands, the clock face missing the seconds hand. If you want to set the time, pull the crown out to position 2 and turn it forwards or backwards. When you’re done, push the crown back to normal position. Being trendy is a challenge for most women and girls so having to manage looking amazing on a budget can turn out to be impossible. Don’t worry if you have to make a few cuts when it comes to fashion, with our tips you will look good with minimum money spent. Hunt for discounts – this may be the most basic thing to do when it comes to shopping for clothes on a budget, but you would be surprised to know that a lot of women tend to forget about it. 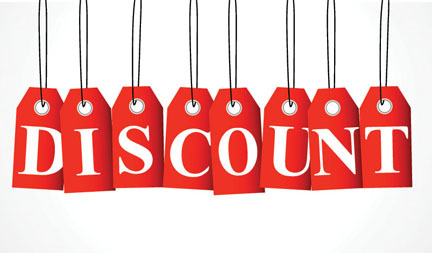 There are amazing discounts out there and you can always use coupons or shop with friends for more items in order to get some discount on the final sum. There are a lot of comparison websites that will tell you where is the cheapest item in that category so make sure that you use them. Have you considered making your own clothes? Or at least your own accessories? There are so many magazines out there that teach you how to craft and you can become a designer yourself. Who knows? Maybe you will sell some of your crafts to your friends and make some money in the process. At least when it comes to accessories you don’t have to pay a fortune on a beaded necklace when you can make one yourself on 10% of the price. You don’t have to buy expensive brands to be trendy. Nobody will be able to tell if your top is 10 or 100 dollars if you know how to accessorize it. So buy at department stores and even second hand stores, you will find a lot of things worth taking home. You will be surprised to see how much money you can save by doing only this.